SO sorry this post is going up so late. Busy at work + long weekend without internet + busy at work + kiddo = uber late! 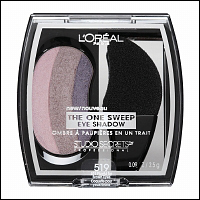 Anywho, congrats to headant you’re the winner of the l’oreal one sweep eyeshadows, yay! I hope they work out for you! Thanks to everyone who entered and for taking the time to comment or like me on twitter or Facebook…hey still haven’t liked me on Facebook? If you wanted to take pity on me and like my Facebook page that would be awesome of you ! Thanks again for entering !